Alumni and retirees encouraged to bring the past into the present. As Selkirk College marks a major golden milestone, alumni and faculty gathered together, joining the celebration. With 50 years of classroom camaraderie in the varied programs on all campuses, it was the perfect time for reunions. As part of the Selkirk College 50th Anniversary celebration, there were several reunions held. One of these get-togethers was organized by the faculty who served learners over the first five years of the college (1966 to 1971). The first three faculty who taught Geography at Selkirk College include (L-R) Jim Crowley, Jim Cromwell and Don Couch. The group are seen here at the Squamish steam train. “There were approximately 100 faculty and assistants during those years and this was an opportunity to share tall tales, fibs and exaggerations,” says former Geography instructor Don Couch (1966-1970). 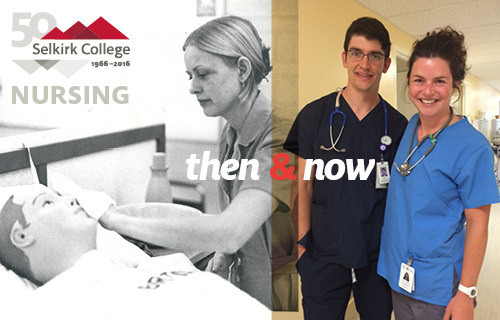 Join us on our Selkirk College Nursing Facebook page.